Since we are headed off to Italy, I have been getting into the spirit with all things Italian. I have been taking Italian lessons with Duolingo, doing some very in-depth research (eating) of the various types of pasta and pizza, and have been finding ways to incorporate my favorite Italian liquor into anything I can think of. 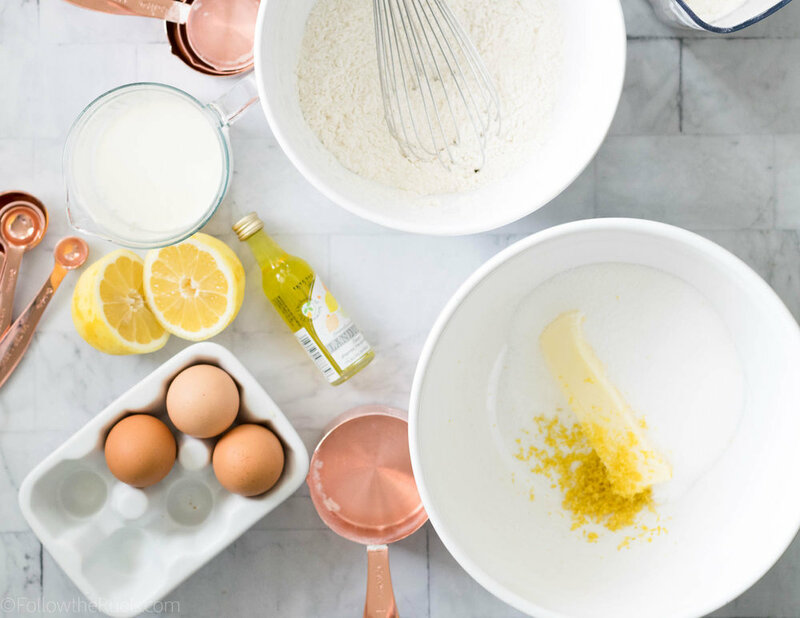 Hense these limoncello cupcakes that just as delicious as they are nice to look at! To make the cupcakes, start by getting all your ducks in a row. It will make the cake making process so much easier. First combine the butter, sugar, and lemon zest. In a separate bowl mix together the dry ingredients. Then in another bowl or measuring cup combine the wet ingredients. Cream together the butter and sugar until light and fluffy. Then mix in the eggs one at a time. Alternate mixing in the dry and wet ingredients, starting and ending with the dry. For me, I like to do this in five parts: dry, wet, dry, wet, dry. Portion the batter into the muffin tin so that each cup is about 2/3rds full. I like using an ice cream scoop because it makes this step so much easier. Bake until they are just a little bit golden around the edges or until a toothpick stuck into the center of the cupcake comes out clean. 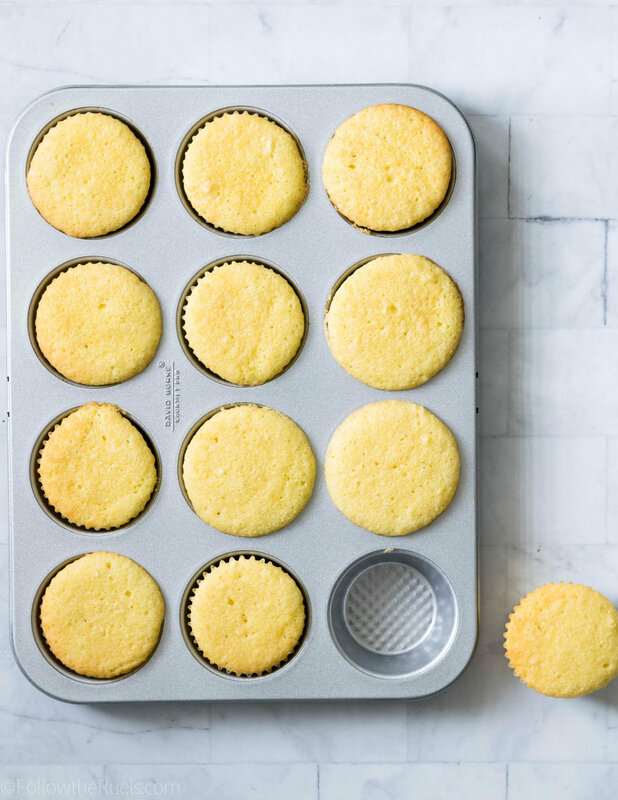 As an optional step to really impart more limoncello flavor into the cupcakes, you can brush the tops of the cupcakes with a little bit of limoncello. Not only will you get a tad more flavor (and a little kick! ), but it will ensure that the cupcakes stay nice and moist. Decorating, for me, is the best part. 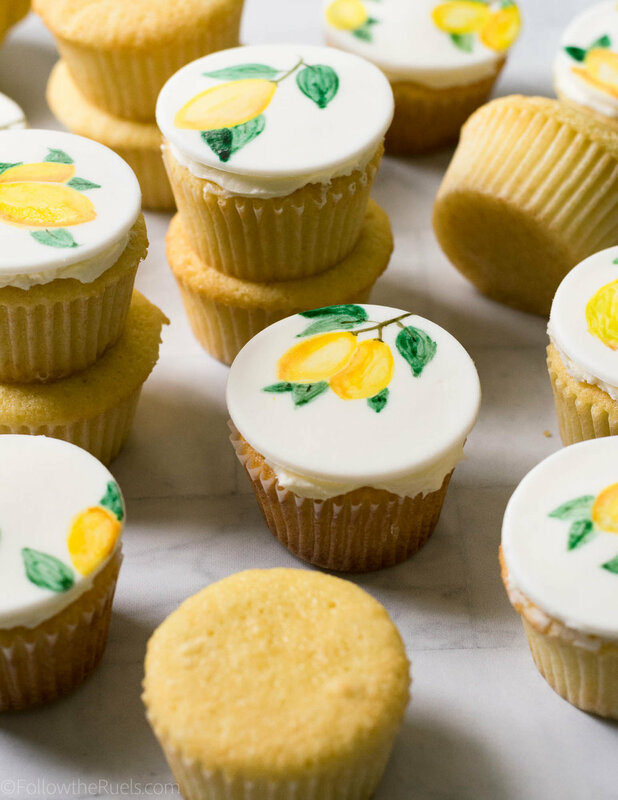 And these limoncello cupcakes are actually really simple to decorate thanks to the fondant topper. 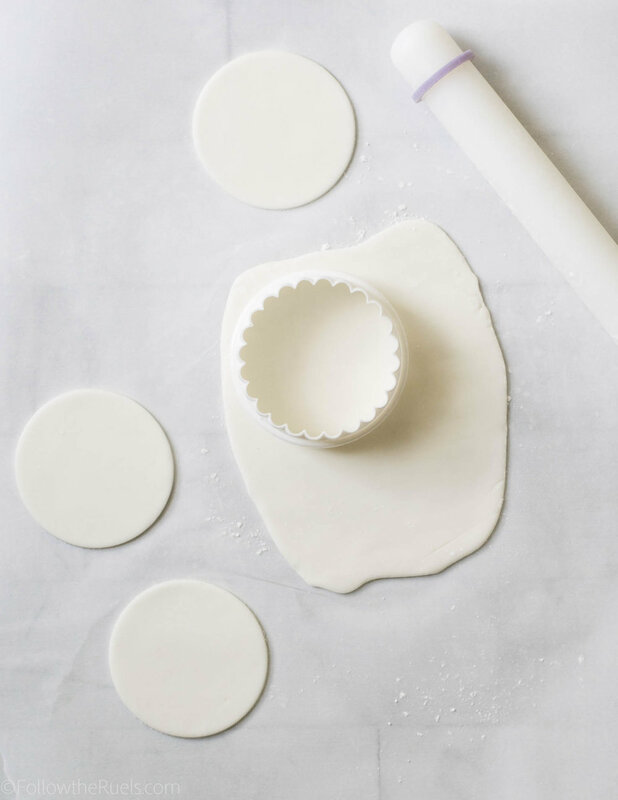 Start by rolling out some fondant so that it's about 1/8th to 1/4th inch thick. Then cut out with a round cutter about the diameter of the top of the cupcake. Paint the fondant using a combination of food coloring and clear alcohol (I use vodka) to create a paint similar to watercolor. From here, let your creativity shine and paint whatever you like. I personally like to paint the basic shapes first, let that layer of paint dry a bit, then paint in additional details on top. One thing to know about painting on fondant is that it can get gummy if you use too much liquid. Just keep that in mind as you are painting or painting over another color. Once the paint has dried (which will only take a few minutes), you can add the fondant toppers to the cupcakes. First spread on a bit of buttercream over the top of the cupcake. It doesn't have to be pretty, but I recommend trying to get the top as even as possible. Then lay the fondant circle right on top. Gently press down the fondant so that it is firmly attached to the buttercream and is laying flat. And there you have it. Super delicious, beautiful, but easy to make limoncello cupcakes! In my mind, it's the perfect way to get excited for our Italian adventure! Preheat oven to 350 degrees. Line two muffin tins with paper liners. In a separate bowl, cream together butter, sugar and lemon zest until light and fluffy. Mix in the eggs, one at a time, until just combined. Add lemoncello and lemon juice to milk and stir to combine. Add a third of the flour mixture to the butter and egg mixture. Mix until just barely incorporated. Add in one half of the milk and mix until just barely combined. Repeat with half of remaining flour and remaining milk. Then finish mixing in the rest of the flour mixture. Spoon the batter into each muffin tin, filling about 2/3rds of the way full. Bake for 22 to 25 minutes, or until a toothpick comes out almost clean (a few crumbs are good). Let cool in tin for 5 minutes, then transfer to a wire rack to cool completely. If you have leftover lemoncello, lightly brush the tops of the cupcakes with some lemoncello until the top is damp. Cut out 3" circles of fondant, rolled to 1/8" in thick. Paint or decorate as desired. 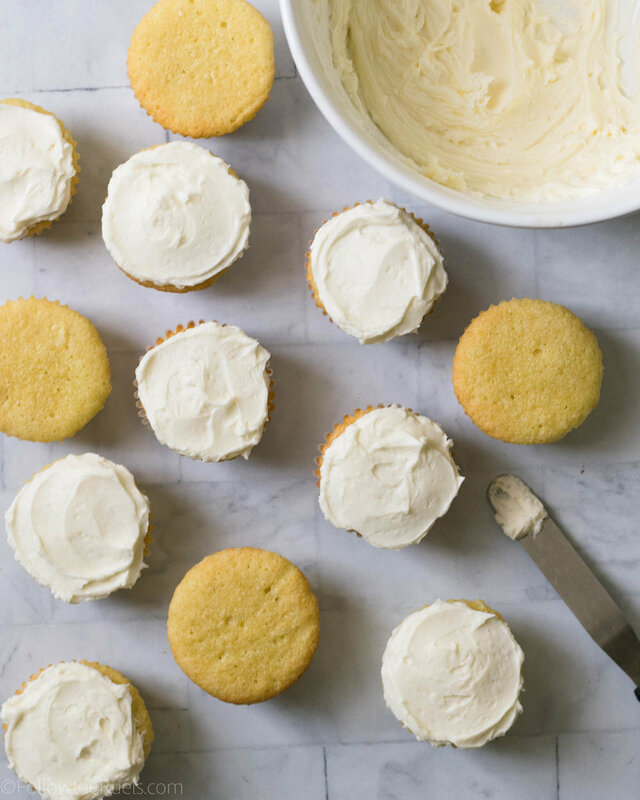 Spread buttercream on the top of each cupcake. Top with a circle of fondant.